A simple 7-mile long rural road in New Jersey. What could be wrong with that? Local legend says, much! 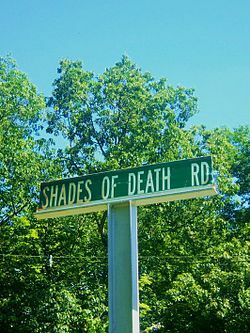 Some roads can be cursed by their history or by their mere setup. This roadway has twists and turns that can be dangerous for drivers, very dark shadowy areas that never see the sun, and then there's the deaths! In the 1920s and 1930s, there were some gruesome murders there. One man was hit over the head with a tire iron and robbed. Another woman killed her husband, cut off his head and buried his head and body on opposite sides of the road. A man was also shot and buried in the mud. There were also many other legends including vicious wild cats attacking folks near the swamp, malaria-ridden mosquitoes killing people, and car accidents. 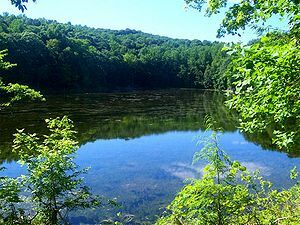 Near the road is a body of water called "Ghost Lake." A blocked off creek created a pond and it catches the mists and has ghostly fog above it often. There is a cave nearby called "Fairy Cave" used by the Lenape Tribe. As happens often in historic Native sites, people came to think it might be burial area or such. Lenape Lane is an offshoot to a dead end where there is an abandoned stable. It has a strange phenomena of wisps of fog that look rather ghostly. People that go there at night say they see a white orb at the end of the road and legend says, if it turns red, you will die. More and more legends built up over time to include legends of a Native who can turn into a deer and appear, if a driver stops on the bridge, puts on his high beams and hits his horn three times, two child ghosts will appear. The legend of the bridge is regarding an old bridge no longer there since a new one was built.